It is obvious that there arc no elephants in Russia, except those in the ZOO, but nevertheless, our country can make a great donation for the increasing the population of elephants in the world. That for a long time has understood Valeria Mokeeva working in the field of a collectioning, professional findings, producing and selling art objects (sculpture, decorative art objects, jewelry) made of mammoth tusk. The motto of Valeria is "Mammoth tusk is the mean for saving elephants and the art of bone carving". In these undertakings Valeria Mokeeva is supported by the first chairman Mammoth Committee of the Russian Academy of Science - academician Orest Scarlato, who recommending to russian masters of carving "to use mammoth tusk for making art objects instead of ivory for saving the elephants". Art objects Valeria's and her scholboys presented on the exhibitions made of the unique fossil material - Siberian mammoth tusk, which comes from Taimyr, Chukotka, Jakutia and Kolyma. Mammoths, who were the ancestors for elephants, appeared on the Earth 4,5 millions years ago, mostly on the territories of modern Europe, Asia and Northern America. There were thousands of them and mostly numerous mammoths were in Siberia. Supposed, that the population of mammoths was increasing in cold periods and decreasing in warm. They differed from the elephants with long brown hair, big neck and thick layer of fat to preserve the warm. 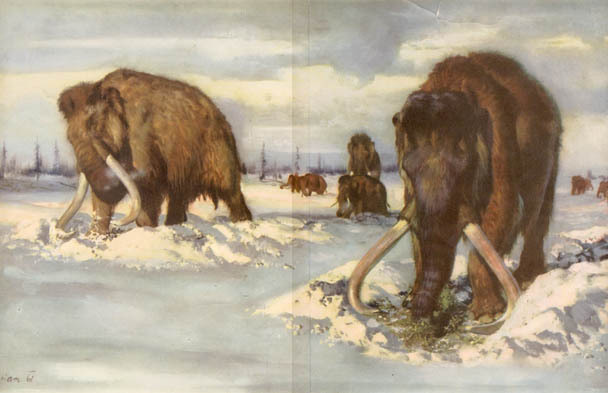 Being very big (3,3 m. high), mammoths were vegetarians, with their huge tusks they were able to get the food from under the snow. Their tusks were up to 4 metres long with weight up to 88 kg. 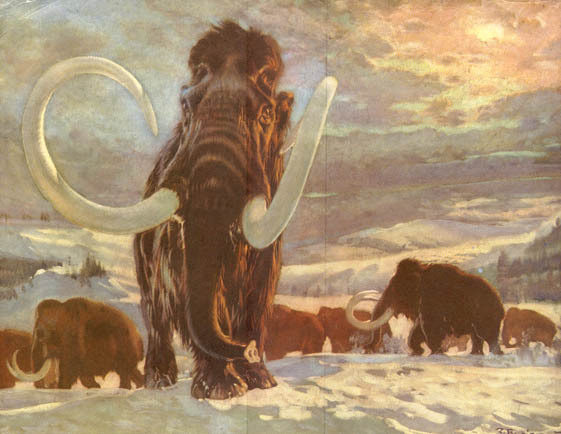 The average age of mammoth was about 80. They disappeared from the Earth because of changes in climate to too warm for them about 12-40 millenniums ago. The population of mammoths was big, and they were on the Earth fora pretty long time and in the layers of Siberian permafrost, in this "eternal refrigerator of the Earth" the great number of tusks preserved. (so called "mammoth cemetries" the result of concentrating tusks, skeletons etc. of fossil animals: cave bear, prehistorical horse, hair thinoceros and prehistorical bull) The most famous mammoth cemetry is on the Berelekh - river in northern Yakutia. Cemetry appeared because of the concentrating of animals, which dived in the downstream lake and later were covered with ice ). Because of the permafrost the condition of tusks is out of critic. The surface is usually dark, but under it lays the bright and beautiful in colour and structure original mass. Sometimes metal salts paints tusk in beautiful blue-&-green, brown-&-red colours. Most precious and random are pink and black tusk. Such a tusk gives a possibility for a master to create an extraordinary things very unisual and unique. Being bedded in the ground for milleniurns of years tusk accumulated magnetic fields and energy, so it become the talisman material. It was valued in Russia for a long. Even during the tsar Ivan the Terrible the mining of the "blue bone" was already under the slate control. Miners were to pay 10% of their pray for the state. 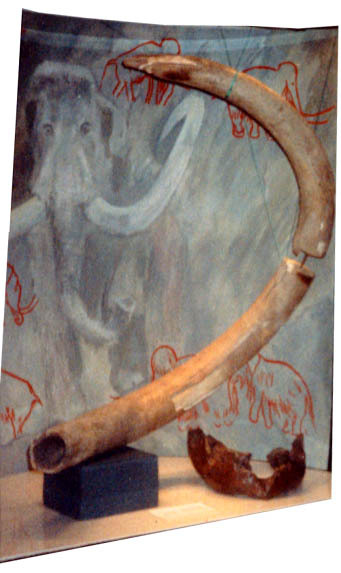 Peter I the Great was very fond of carving and promoted the mining of mammoth tusk. Now the process of mining is the same as centuries ago. In spring after the snow and ice are gone, after the floods of the rivers tusks and skeletons appears from under the ground and miners arc digging it from the ground. This material is as random and precious as gemm stones and precious metals. It is simular to ivory in colour and structure and because of that "mammoth tusk is amean for saving elephants and art of bone carving.